Mumbai, March 28, 2018: Kansai Nerolac Paints Ltd. (KNPL), one of the leading paint companies in India and pioneers of ‘Healthy Home Paints’ has announced its continued association with the most followed sports extravaganza in the nation, IPL. For IPL 2018, Nerolac will continue to sponsor the Sunrisers Hyderabad. 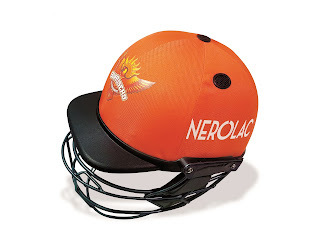 This year also, the brand Nerolac will be visible on the helmets of Sunrisers Hyderabad. Nerolac has been an active advertiser in BCCI events for a very long time. In 2016, it associated with Gujarat Lions and to further deepen connect with the sport, Nerolac Paints became the official partner of Sunrisers Hyderabad in 2017. Nerolac Paints has always believed in performance and its products are a testimony to that. It believes in the significance of sports as a marker for human performance and cricket continues to be the biggest unifier of it in India. Thus, IPL becomes the natural platform to create a strong emotional connect with the nation. Nerolac Paints has always strived to create unique experiences for its stakeholders that money cannot buy. Efforts have been taken to also increase the livelihood earning opportunity of its partners. One such key initiative in the past was the ‘Man of the Match Grant’ whereby a total of 83 youth were trained and skilled to take up livelihood through painting. This year too, a variety of initiatives are being lined up to continuously build upon the association and the company will soon be announcing the same. “It is a matter of immense pride for us to partner with brands of stature such as Nerolac, as we gear up for the eleventh season of the Indian Premier League. This is an important season for us and renewed support from Nerolac, SRH’s lead helmet sponsor, will be vital as we bid to win the title after a solid show last season where we qualified for playoffs. With a stronger partnership this year, we look forward to continue what promises to be an exhilarating, and hopefully in our case, a triumphant journey ahead” said Mr. K Shanmugam, CEO, Sunrisers Hyderabad, expressing his excitement about the continued association.